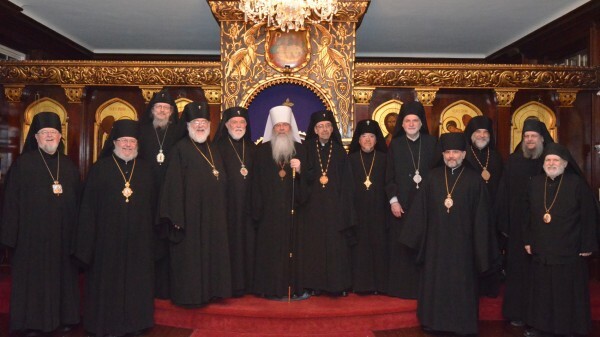 The Holy Synod of Bishops of the Orthodox Church in America held its spring session at the Chancery here March 17-20, 2015. The session was chaired by His Beatitude, Metropolitan Tikhon, who in his opening remarks thanked the members of the Holy Synod, the Chancery staff, and those who facilitate the Church’s boards, committees, commissions and departments for their work and ministry. After hearing the report on the work of ORSMA and SMPAC, the Holy Synod decided that all faculty, staff and administration members of the OCA’s seminaries, together with all faculty members and students enrolled in diaconal programs, are required to undergo Level Three background checks. It was noted that all background checks on clergy shall be initiated by the diocesan bishops. The Bishops also agreed that they will participate in a “SMPAC Training Day” in the fall of 2015. In response to the report of the OCA Pension Board, it was decided that clergy members retired from full-time ministry, yet who in retirement serve mission parishes, may do so without compromising their pensions. The Bishops selected June 9-11, 2015 as the date for their annual retreat, which will be held at Dormition Monastery, Rives Junction, MI. A discussion on the membership of the Canonical Commission, Canons and Statutes Commission and the Liturgics Commission ended Tuesday’s sessions. Upon learning of the repose of Protopresbyter Thomas Hopko, the Bishops paused to celebrate a Panikhida for his repose. Condolences were offered to the members of Father Thomas’ family. The members of the Holy Synod then heard the reports of the OCA’s officers. Archpriest John Jillions, Chancellor, focused on some proposed initiatives, including the work of the recently reconstituted Department of Pastoral Life. He requested that the Holy Synod appoint a commission to gather materials and resources reflecting the life of the late Metropolitan Leonty. In response, and at the request of the Holy Synod, Metropolitan Tikhon appointed a committee, comprised of the Lesser Synod and three additional individuals to collect and catalogue resources related to Metropolitan Leonty in conjunction with the 50th Anniversary of his repose this year. Archpriest Eric G. Tosi, Secretary, reported on the administrative work of the Church and presented a detailed update on plans for the forthcoming 18th All-American Council [AAC]. The Holy Synod approved the AAC’s general agenda and structure of the plenary sessions. They appointed the AAC’s clergy and lay chairs, who had been nominated by the Preconciliar Commission and Metropolitan Council, and approved a number of AAC-related issues related to the agenda, notices, arrangements, resolutions and reports. After reviewing the Church’s finances and the current audit, Melanie Ringa, Treasurer, presented the recommended resolution of the Metropolitan Council and Finance Committee, to be presented at the 18th AAC. After lengthy discussion, the Holy Synod approved a revised resolution on funding the Central Church Administration for the triennium 2016-2018 for presentation at the AAC. Protopresbyter Leonid Kishkovsky, Director of External Affairs, offered an in-depth report on the OCA’s participation in various ecumenical, inter-Church and external organizations. After Wednesday’s sessions had concluded, the Bishops once again gathered in Saint Sergius Chapel for the celebration of the Liturgy of the Presanctified Gifts, celebrated by His Grace, Bishop Daniel of Santa Rosa. Thursday’s session opened with a presentation by Judge E. R. Lanier, Chair of the Metropolitan Council’s Legal Committee, in which he reviewed the current legal status of the OCA and offered an update on procedures and qualifications with regard to the search for a General Counsel for the Church. In other matters, Archpriest Theodore Boback and Marge Kovach offered a presentation on the work of the Fellowship of Orthodox Christians in America, while Basil Russin reported on the work of the Philadelphia-based Russian Brotherhood Organization. The Holy Synod heard a report by Archpriest Chad Hatfield, Chancellor of Saint Vladimir’s Seminary; Archpriest Steven Voytovich, Dean of Saint Tikhon’s Seminary, and His Grace, Bishop David on behalf of Saint Herman’s Seminary, after which various issues and updated plans were discussed. The discussion also considered issues related to theological education, the preparation of candidates for ordination, and the training of Church musicians and other Church leaders. Father Chad requested that the Holy Synod reaffirm its support of the “One Percent” resolution that calls on every parish to allocate one percent of its operating budget for the support of the seminary or seminaries of its choice. Father Steven presented a resolution from Saint Tikhon’s Seminary asking that the annual June Seminary Appeal be reinstated. In closed session, the Holy Synod reviewed a number of clergy cases, including that of Archbishop Seraphim. Having thoroughly reviewed the report of the Synodal Commission in this regard, procedures and a date for the convening a spiritual court were reviewed, with a committee of three Bishops appointed to develop appropriate procedures. His Grace, Bishop Paul of Chicago and the Midwest, celebrated the Liturgy of the Presanctified Gifts in Saint Sergius Chapel on Friday, the final day of the session, after which the Holy Synod considered and approved a number of elevations and clergy awards. Elevated to the rank of Archbishop were His Grace, Bishop Michael of New York and New Jersey; His Grace, Bishop Irénée of Ottawa and Canada; and His Grace, Bishop Mark of Philadelphia and Eastern Pennsylvania. In recognition of his outstanding contributions in the field of liturgical music in the OCA’s Romanian Episcopate, Archimandrite Roman [Braga] will be awarded the Order of Saint Romanos. Reports from the OCA’s Departments and Committees also were received.